Jim O’Brien was formerly employed by North American Roofing, where he was hired in March of this year. The company announced Tuesday that they had severed O’Brien’s employment, stating "We do not support the extremist activities that were on display in Charlottesville, Va. over the weekend or any other similar activity," it says. "We promote a culture of inclusion and diversity." Footage from the rally appears to show O’Brien, marching with the League of the South, punching a woman repeatedly in the face. The man dressed in a black polo, black hat and sunglasses, can be seen repeatedly striking the victim beginning around :30 seconds. 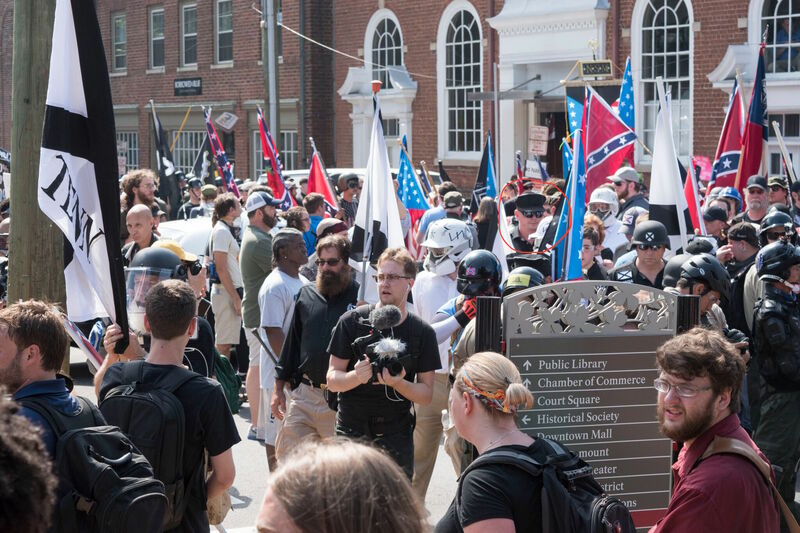 Other footage of the incident shows the woman being pulled into a crowd of LOS members and their Nationalist Front ilk by Kentucky chairman Spencer Borum and thrown to the ground. O’Brien is visible in the crowd in this photograph, wearing the same black hat and wraparound sunglasses as in the video. Jim O'Brien at the Unite the Right Rally, before his arrest. Jackie Mercandetti photo. ORIGINAL STORY — On August 12, Virginia State Police announced the arrest of three suspects in connection with Jason Kessler’s Unite the Right (UTR) rally in Charlottesville, Virginia. Among them was James M. O’Brien of Gainesville, Florida. O’Brien was arrested and charged with carrying a concealed handgun. 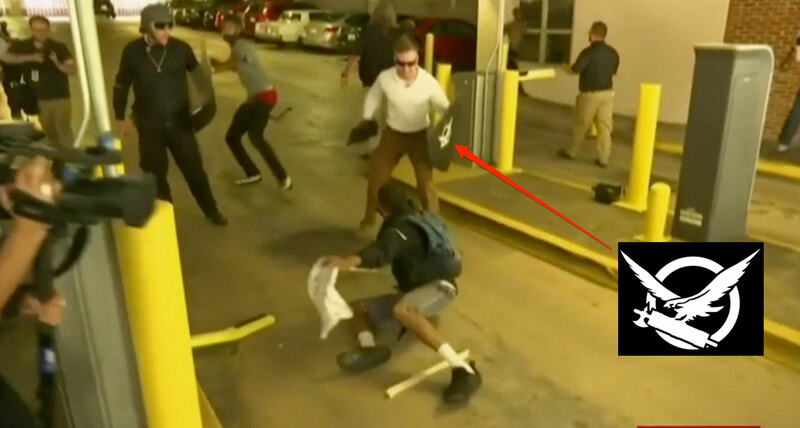 O'Brien was arrested on the same day local SWAT units rushed a parking garage after members of the Neo-Confederate Florida League of the South (FL LOS) were filmed viciously beating a black man, who attempted to run away, fell, and was savaged once again. 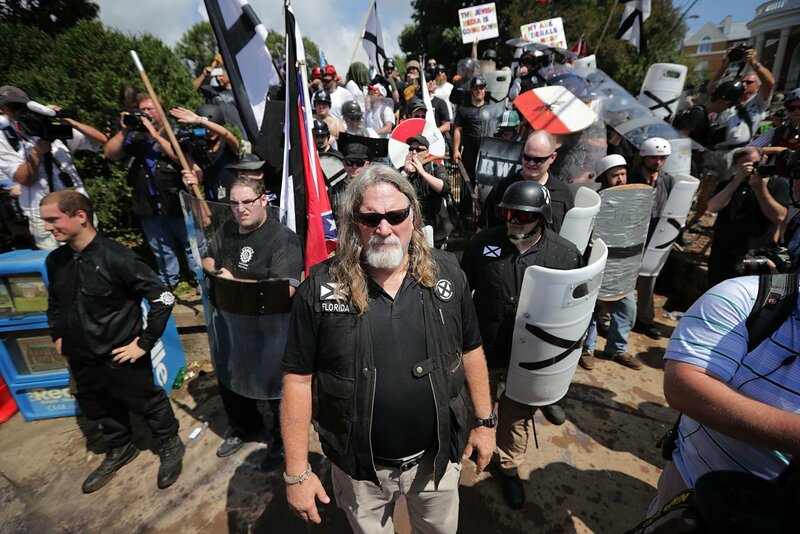 Also visible in the video was at least one man carrying a shield with a Vanguard America logo, much like the one carried by James Alex Fields, who allegedly drove his car through a group of counter protestors killing one. The video of the beating occurs about 26 seconds into the CNN clip below. A man carrying a shield with the logo of Vanguard America on it during the attack. Social media seems to indicate that the same James M. O’Brien is a member of the FL LOS, a militantly racist organization intent on seizing federal equipment from the Florida national guard in its desire to see the states of the Confederacy secede and form a white ethno-state. 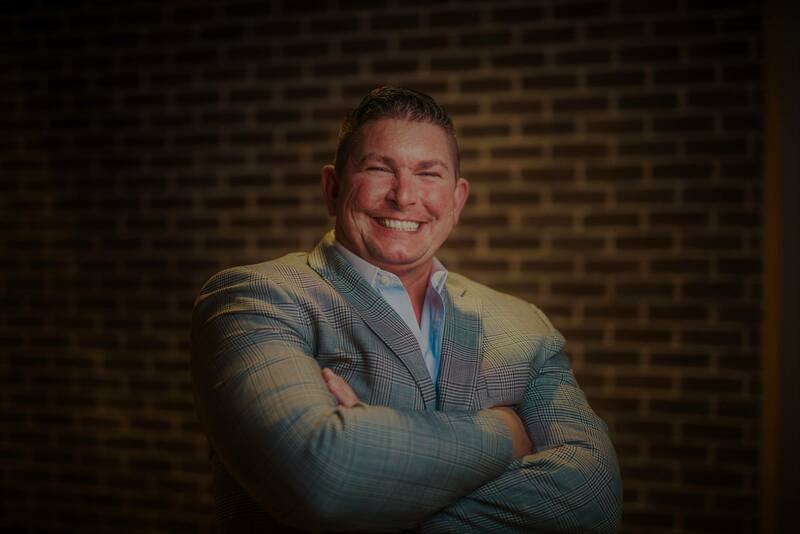 A Facebook profile under the name of Jim O’Brien, from Gainesville, Florida matches available records for O’Brien and lists the following occupations: Former Management at U.S. Department of Defense (DoD); Past, Artemis Global Inc. and Tamerlane Global Service, and ties to William and Mary University, Virginia Beach, and Leesburg, Virginia. O’Brien also lists himself as a United States Marine Corps Veteran. 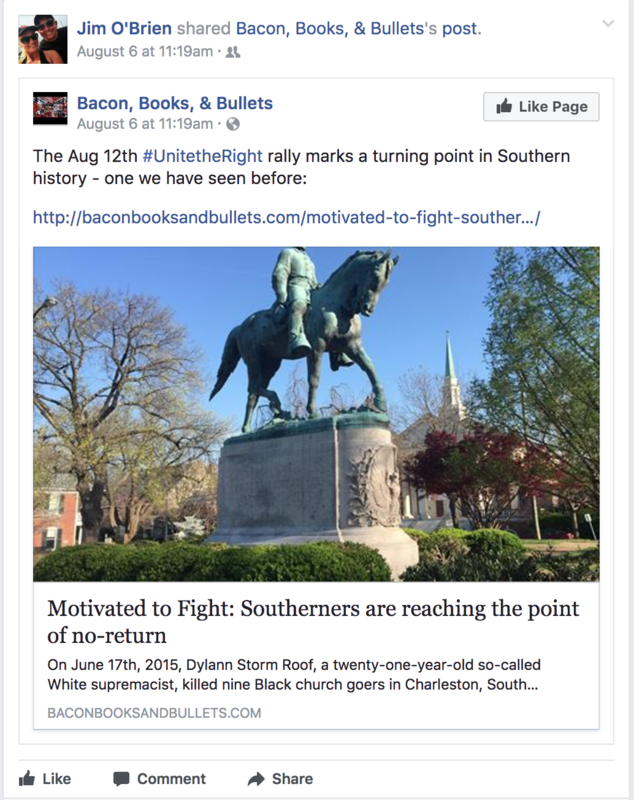 O’Brien’s Facebook page, made available to Hatewatch, features posts about the Charlottesville rally and references to militant “Southern Nationalism." 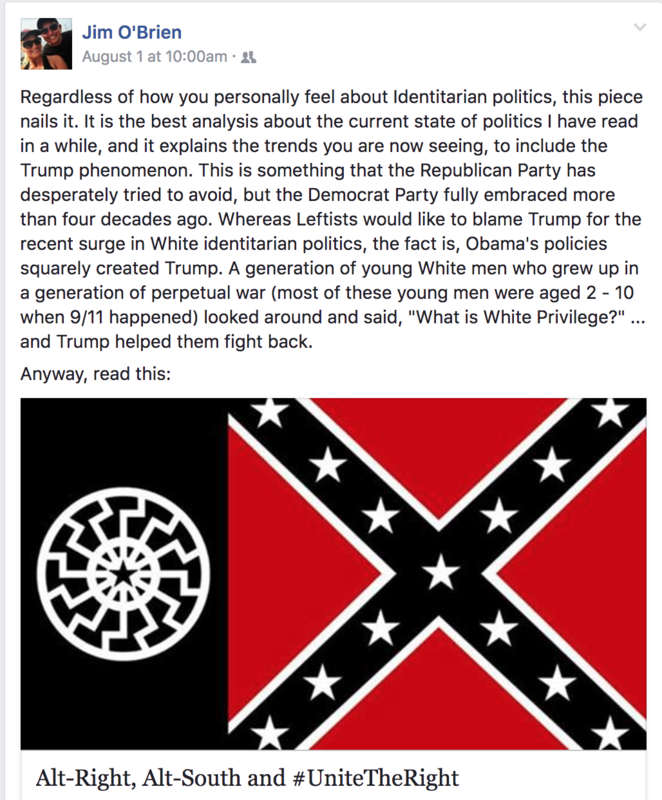 A Facebook post by O'Brien indicating that he would be attending the Unite The Right event. O’Brien also appears to run a blog titled “Bacon Bullets and Books." 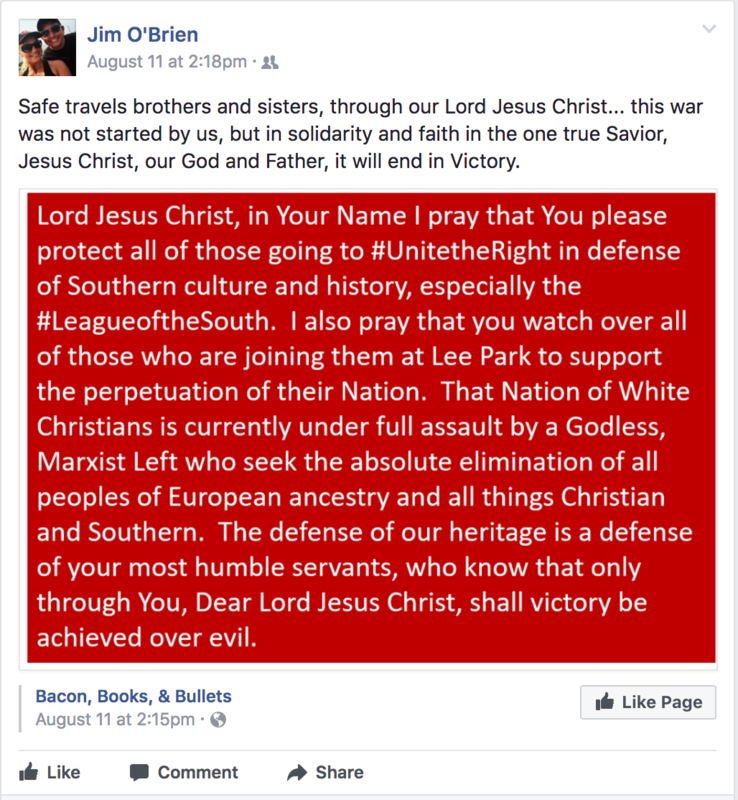 The same "Bacon, Books, & Bullets" shared a “prayer” for League of the South members traveling to Virginia. 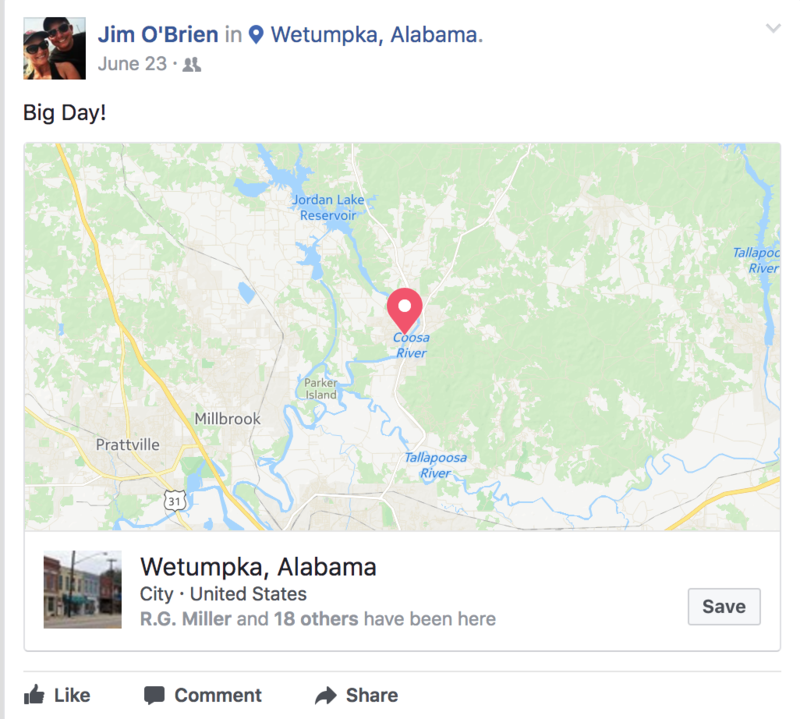 O’Brien shared that he was in Wetumpka, Alabama, for a “conference” on June 23, 2017, the same day as the League of the South’s annual conference. 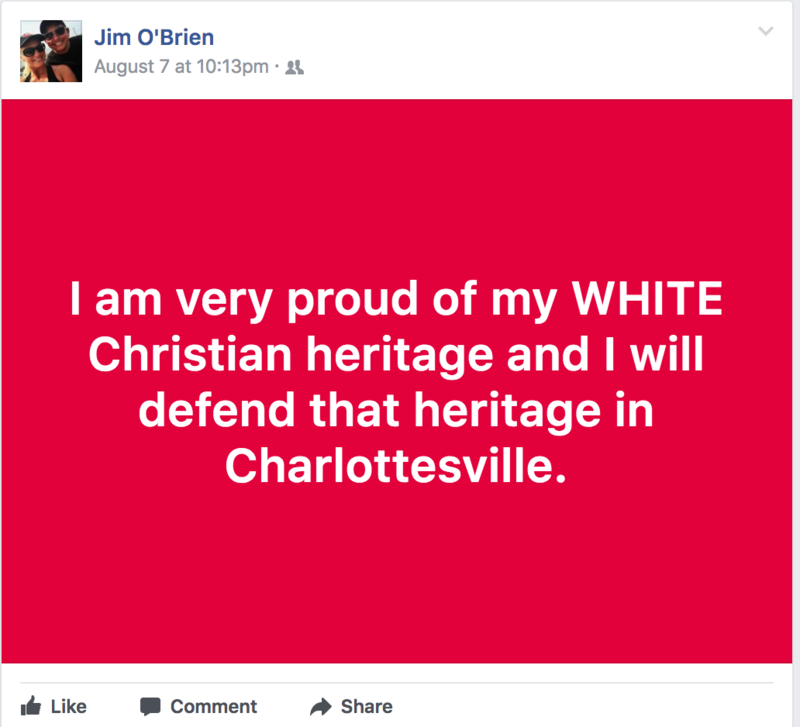 O’Brien posted several updates this weekend indicating that he was en route to and present in Charlottesville during the protests. O’Brien is friends on Facebook with several known League of the South members, including Florida state chairman Michael Tubbs, another veteran who went on to lead the Florida League of the South after he was released from prison for his role in a plot to bomb Jewish and black-owned businesses in Jacksonville, Florida. 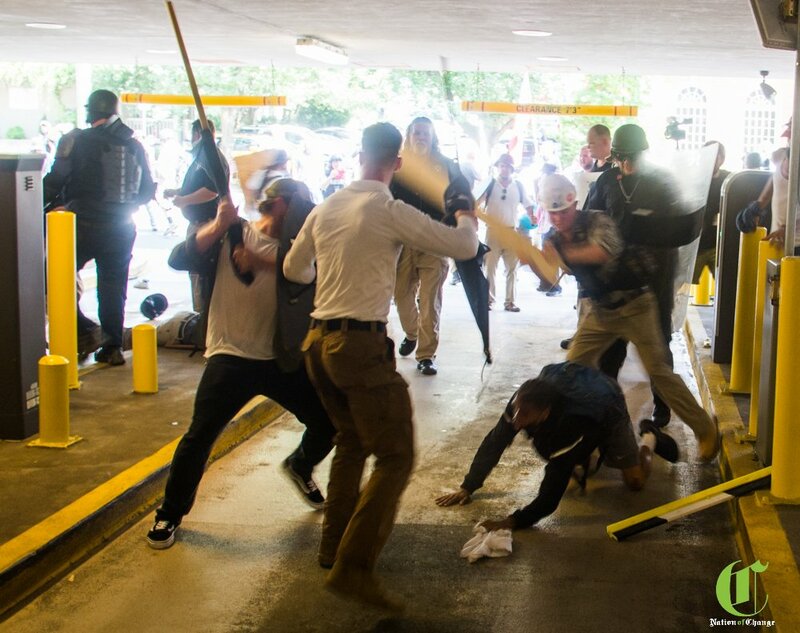 Tubbs was photographed in several brawls throughout the day. Chairman of Florida League of the South Michael Tubbs front and center.